I think April Lang has done a moving and powerful job in presenting this difficult subject of animal abuse to the world. The anecdotes and stories from different people involved in the compassionate endeavor of saving and helping the worlds most vulnerable beings, are heartbreaking and inspiring. I believe the only way we can go forward to a compassionate world is to listen to the cries of those who cannot speak our language and to stop using/abusing them for food, pleasure, science and entertainment. This is a thoughtful and sensitive examination of the challenges and rewards of a vegan lifestyle. However, the book is so much more than that since it also provides a glimpse into the lives of animal advocates who are working in different ways to improve the lives of animals. These advocates share both the pain and the joy that they experience in the course of performing their very important work. Their stories give hope to those of us who strive to make an impact for animals in our own lives but frequently feel discouraged at the lack of progress in the world generally. Obviously we are not alone in experiencing ups and downs. The author also provides techniques to recognize and lessen anxiety (breathing techniques etc.). All in all, this is a wonderful book for those who are living a vegan lifestyle and for those who are seriously considering embracing veganism. Kudos to the author for tackling a difficult subject and providing such a valuable tool for advocacy. 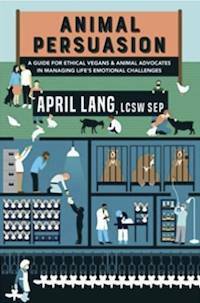 Whether you’re already living an ethical vegan lifestyle or are considering making the transition, April Lang’s book provides inspiration for your compassionate choices and valuable support to guide you on your journey. The author validates the powerful emotions that can arise daily for those courageous people who make this journey, and offers strategies for successfully managing those feelings. The testimonials of animal activists on the front lines in the struggle to create a more respectful and compassionate world for animals are powerful, provocative, and ultimately persuasive. April Lang, LCSW, SEP, has been a vegan for the past fifteen years and is a passionate animal-rights advocate with a special interest in humane education. She is in the process of receiving her CHES certificate (Certified Humane Education Specialist). Please read Fighting the Oldest Tyranny.